I was skeptic about this film, but it proved me totally wrong. 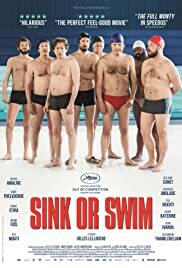 It's really powerful and emotive, a beautiful story about a group of man each failing his life in his own way and trying to reclaim their manhood through Synchronized swimming. it might sound absurd said like this but it's really good a perfect reflexion of the crisis of masculinity of our time, add to it it's a perfectly funny and comical film.